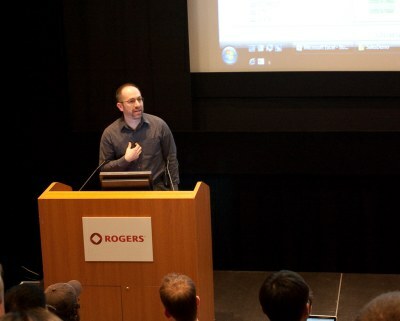 As I always do I had a great time at Democamp in Toronto this past Thursday. But this Democamp was very special for me, as I was one of the presenters, and had a chance to show off the beta of the next version of Datamartist. 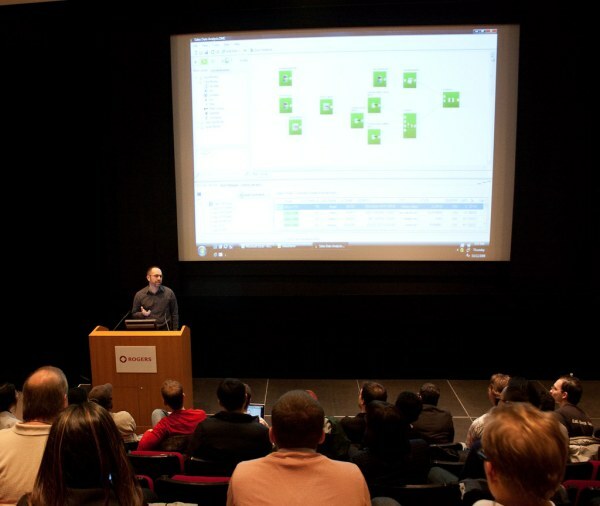 Thanks to Geoffrey Wiseman who covered the event on his blog Tech scene, you can watch the video of the presentation. It was lots of fun, and we got some great feedback. A few people came up after and used the term "Excel Hell" to describe some of their previous data transformation experiences, and they were right into what Datamartist could do. Note: The event was held in an auditorium in one of the Rogers offices (which explains the Rogers logo on the podium in the photos)- Datamartist has no affiliation with Rogers of course, but we're grateful for all the support they give the Toronto startup community through sponsoring Democamp and providing such a great space for the sold out event. Drag and drop for file import- just drag flat files or excel files onto the Datamartist canvas, and the blocks are instantly generated, ready to go. Copy and paste data - Copying a range in excel, then right clicking or pressing CTRL-V in Datamartist generates a new kind of block called a "Internal data set". More about these blocks soon, as we have lots of plans for them in this upcoming release. Copy and paste subsets from data viewer- Now you can also copy and paste data internally- click on a stub of a block, select only the rows, or only the columns, or even the cells that you want, press CTRL-C then right click on the canvas and you can paste that data into a new internal data set block. Of course, copy and paste has some limits in terms of data sizes, but it is very useful for reference sets and can still handle pretty good sized sets. The whole drive in continuing to enhance this type of functionality is about making an environment where its easy to move data around, in and out, and transform it- being able to explore the data and get it right where you want it in an intuitive, flexible environment. Stay tuned, lots more to come!